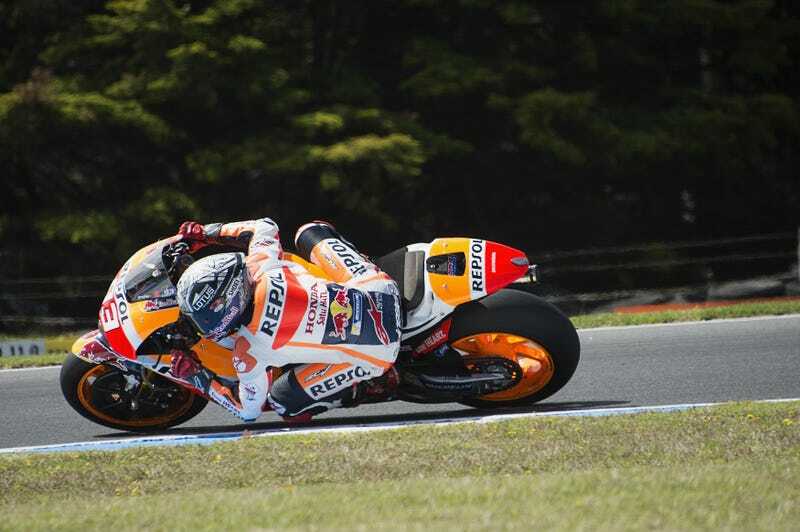 Want to know Honda’s secret sauce in their race bike, what ace racer Marc Marquez thinks about Jorge Lorenzo going to Ducati, or his thoughts on “the kick?” Yeah, so does everyone else, because all the racers keep giving canned responses. So I asked him some different questions from you guys, and got some even better answers. Marquez, 23, is a two-time MotoGP world champion and unquestionably one of the series’ very top talents. That series races in Austin this weekend at Circuit of the Americas, and we’ll be covering the race live. Last year at COTA, Marquez claiming pole during qualifying after running to a backup bike which he then used to shatter the course’s motorcycle record. That led us to call him the greatest motorcycle racer in the world right now. I sat down with Marquez yesterday afternoon for a brief chat before some nice (or large and stern looking) Honda man came and took him away for some on-camera thing. Sean MacDonald: What’s your favorite track on the MotoGP circuit? Marc Marquez: Austin is actually one of them, but I also love Phillip Island and Aragon. I like the left turns, because I grew up riding flat track, and they all have many different types of sections and corners. Lots of elevation changes. SM: What is your favorite thing about the COTA circuit and least favorite thing about the COTA circuit? MM: The best part is the chicanes, moving from one side to the other. This circuit has so many changes and you push so fast from side to side. When you get to the end, they beat you up, but I love that you come into them so fast and then they get slower and bigger as you move through. SM: Your first season in MotoGP, there were three races in the USA, now there is only one. Which track do you like best, and why - Austin, Indy, or Laguna Seca? MM: I love the layout of Austin, but I Laguna just because it is a special place. The bumps, the bankings, the drops. It’s just a special place to be. SM: What era of Grand Prix bikes would you like to ride most? MM: Everyone says “oh, the 500s were the best because they were the fastest,” but I think I would like the 250 two-strokes the most. They have enough power but just so nice to ride. I think I would like to ride those most. SM: If I wanted to have an adventure and rent a bike to do a track day on a MotoGP track anywhere in the world, which would you recommend? MM: I’m thinking Jerez. The weather is really nice and the beach and the people. If you want to do something, there are good parties and food. The track is really nice. MM: I love Supercross. Love it. Motocross is my passion, that is what I grew up doing and what I love most. I watch and follow the whole season. SM: Who is your favorite? Do you have to say a Honda guy? MM: (laughing nervously) Yes, I love the Honda, but I love Dungey this season. His progression is amazing. I also like Roczen and I really like Musquin. I love how Anderson rides. SM: How about Cole Seely? He’s looking really good this year, but sorta like he’s missing something. Missing intensity or determination. Like Dungey was a few years ago. MM: Cole is so good. He’s so fast and always looks like he’s about to crash but doesn’t. I think he’ll get there. SM: Would you like to run the Isle of Man TT one day? SM: But you’d want to ride it fast? MM: Yes, (smiling coyly) fast is fun, but I don’t want to try at the limit. SM: Have you ever ridden a Harley-Davidson? Any thoughts? MM: Yes, I have one. It’s a 883, I got won it, but my uncle rides it. I don’t even have my license so I don’t ride. SM: Have you ridden it? MM: Yes, but it’s uhhhh, it’s not really for me (laughing), it doesn’t really turn. It’s better for my uncle. SM: Are you a fan of the many rider aids like wheelie control, traction control etc? Or would you rather it be all down to the rider? SM: What kind of car do you drive? MM: Right now, I have the Civic Type R, but I’m really excited for the new NSX. I also have a BMW M4, because they give it to me when I win. I really like that. The sound. It’s very fast. I tried next to ask him one of your questions about how he went about choosing a team when his contracts were up, and if it was driven more on data teams presented him or just faith and expectations in their promise of a good bike—but this was about when the Honda people decided our interview, which had already run long, was over. He started to answer, and his answer was as scripted and as much a non-answer as I expected, so I just dropped it.